1. With a small, sharp knife, make a tiny slit in the bottom of the marshmallow and insert the stick about half way up. 2. Using a toothpick dab a tiny bit of royal icing onto the sprinkles to adhere to the front of the mug for decoration. 3. With a serrated bread knife, gently cut the Lifesavers in half with a sawing motion, dab a bit of royal icing on the cut ends and adhere it to the side of the mug. You may want to hold it there for a few seconds to make sure it holds. 4. Melt the chocolate and with a decorating bag and tip add a circle of the chocolate to the top of the marshmallow, not all the way to the edge (leave a rim). 5. While the chocolate is still wet, add the white jimmies (break into pieces) to the top of the hot chocolate as the marshmallows. 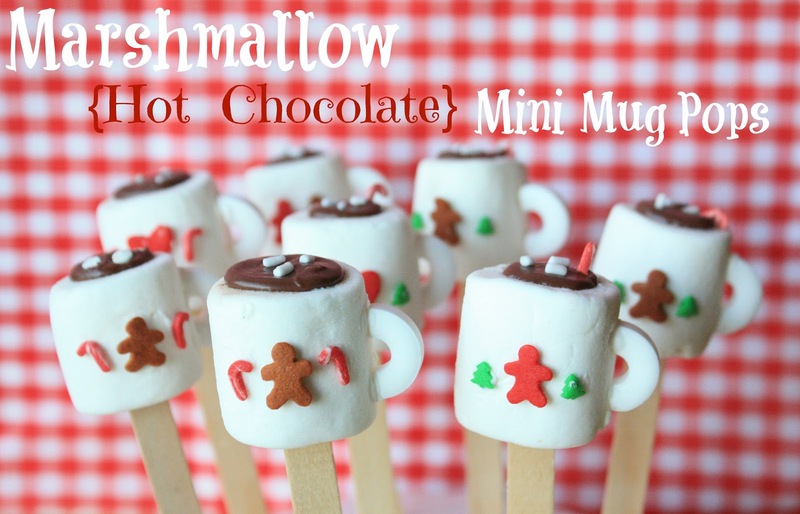 These little cuties can be used for stirring your real mug of hot chocolate, or just eat as a treat. Thanks for all of the inspiration, Lindsay Ann! These are just too stinking cute! I made my grand-babies the hot chocolate spoons last year with the chocolate, marshmallow and peppermint sprinkles but these are way cuter. Very cleaver, thank you. Oh jeez Sue, the cuteness is insane!! I love it! These are both adorable and making me want to eat a zillion of them! I'm not sure what's cuter: your baby turkeys or these little mugs! Love 'em all! Thanks so much for sharing!!! ;) I just love the simple lifesaver handle alternative, genius! Can't wait to feature you at the bottom of my tutorial with a link back to your post! Beyond cute, these are adorable!! You do the very best things with sprinkles! Sue, these are adorable! So darn cute. My daughter would LOOOOVE these! dying over these. soooo cute! Very tasty and funny that suit all young people. Adorable... these would be perfect on top of a mini cupcake! These are so cute and such a great idea. I love that they are a mini version of your previous post too. Yes they are absolutely adorable! aww! I have a thing for making big things small too! love these! Hope your family is having a great Thanksgiving. I'm having an adult candy making class at Avon Grove Library on Dec 11th (we had a pre-teen one in July) and this will be a BIG HIT addition to our assorted filled chocolates! Soooooo, SO cute! I made these but used red string licorice for the handles and little green trees for the front side decorations and they turned out real cute.